Lightweight Furore (Fire) silencer weighs only 1.8-2.4 Kg. Homologated road legal with removable db killer. Made from Aluminum sleeve and special treated to a Black finish, with the unique Furore ergal cap. All mounting hardware included for a perfect fitment. Joints\ mid pipes included where applicable. No modification needed. Designed and Dyno-tested in GPR's factory and hand made in Italy, using advanced TIG welding. Allows better gas outflow from the engine and increase in horsepower and acceleration. The GPR design proves successful in performance and sound. The kit is light weight and will shed off significant pounds of the bike. Includes a removable DB killer according with E3 regulations for sound and pollution. Includes Stainless Steel link pipe and hardware where needed. Comes with GPR's 2 years warranty. 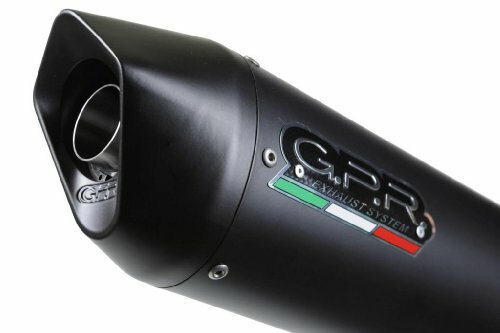 GPR has been making motorcycle exhaust in Milan-Italy for several decades with the spirit of MotoGP and SBK racing, using knowledge acquired thru racing research while sponsoring and supplying riders such as: Casey Stoner, Carlos Checa, Makoto Tamada, Alex Barros and more. Lightweight Furore (Fire) silencer weighs only 1.8-2.4 Kg. Homologated road legal with removable db killer. Made from Aluminum sleeve and special treated to a Black finish, with the unique Furore ergal cap. All mounting hardware included for a perfect fitment. Joints\ mid pipes included where applicable. No modification needed. Designed and Dyno-tested in GPR's factory and hand made in Italy, using advanced TIG welding. Allows better gas outflow from the engine and increase in horsepower and acceleration. Comes with GPR's 2 years warranty. If you have any questions about this product by GPR Stabilizer, contact us by completing and submitting the form below. If you are looking for a specif part number, please include it with your message.